Hi there! This is Tonya Coleman from Soiree Event Design here and I’m one of the featured party stylists for the Birthday Express Ideas blog. 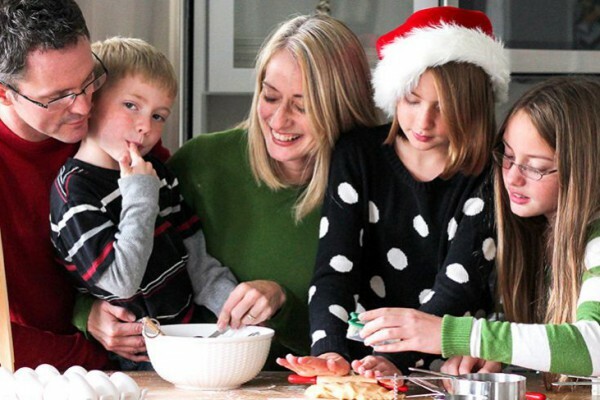 I’m super excited to share with you my tips and tricks on how to pull off fabulous looking parties with less stress. 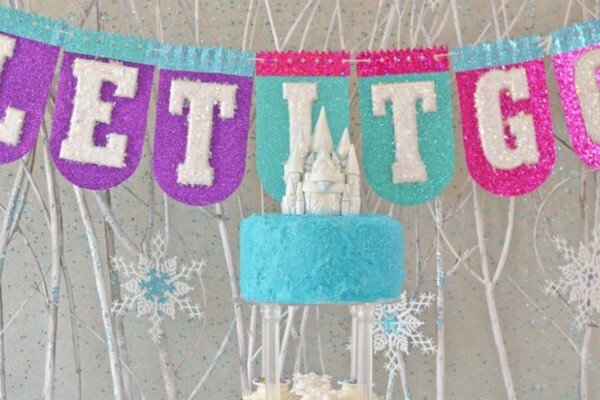 Check out Tonya’s design for a gorgeous Cinderella party! 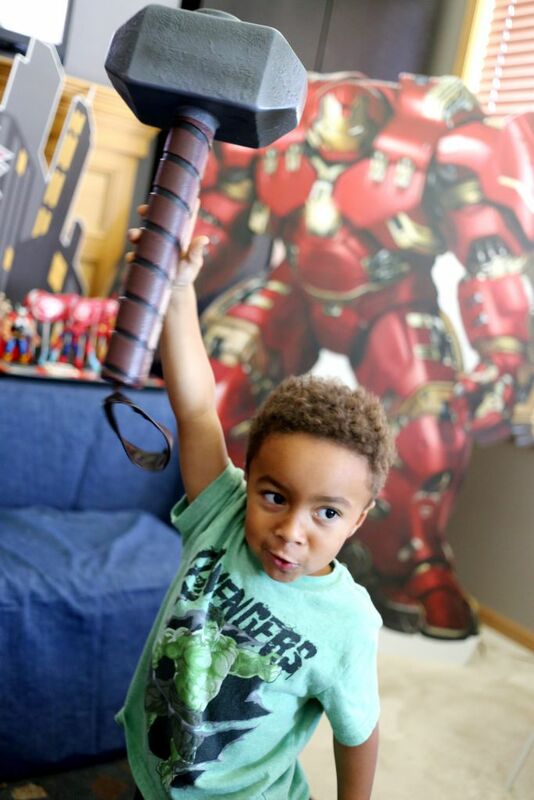 I don’t know about you, but my kids and family are huge Marvel Avengers fans. And we’re not alone. 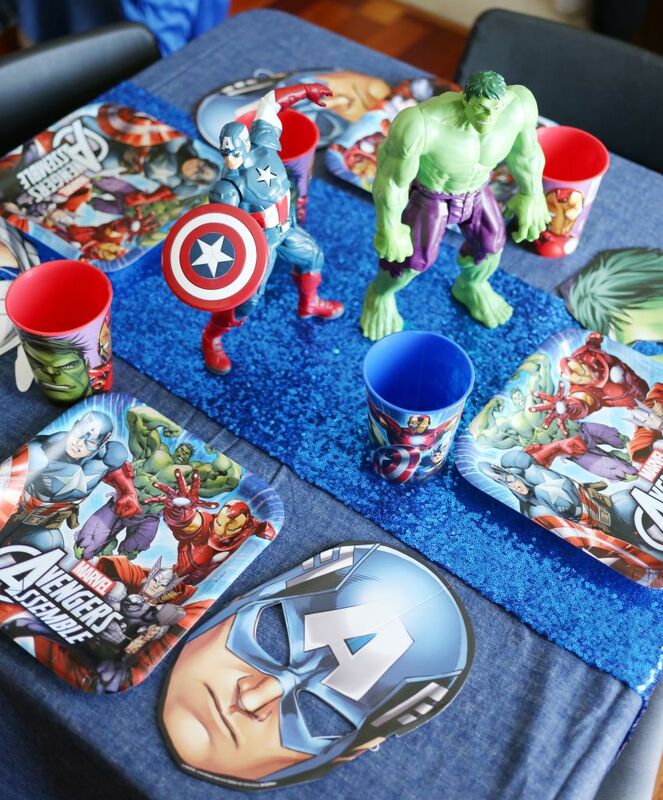 Avengers-themed parties are one of the most popular party themes right now and today I’m going to share with you some ideas to host an Avengers birthday party. Tip #1: Transform Your Home! I love hosting parties in my own home. I just love being able to take my time decorating the space and not have to transport any decorations to an outside party venue. 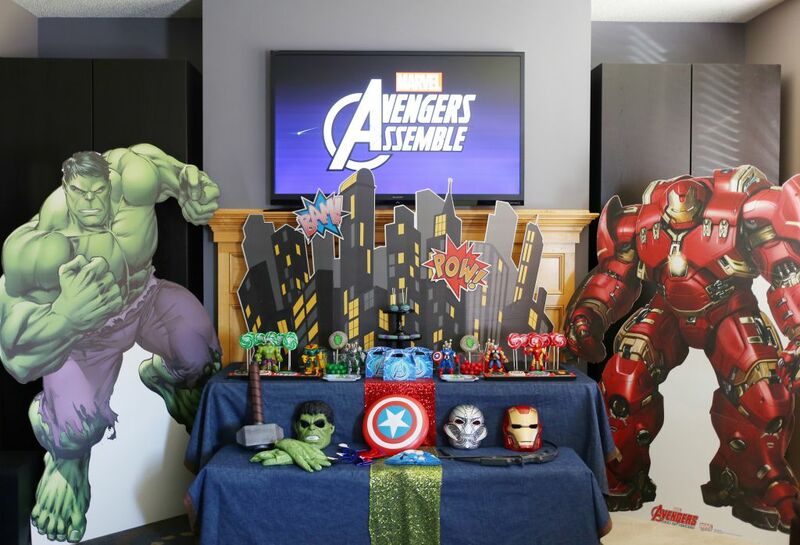 Birthday Express has lots of really amazing party props to truly transform your home into a Marvel Avengers party starting with cardboard standups of each of the Marvel Avengers characters like The Hulk, Hulkbuster, Captain America and Ultron. These standups are about 6’ tall, setup in minutes and really add a wow factor to your party space. My son just kept saying “WOW” every time he walked up to one of them. My brother-in-law was pretty impressive, too. 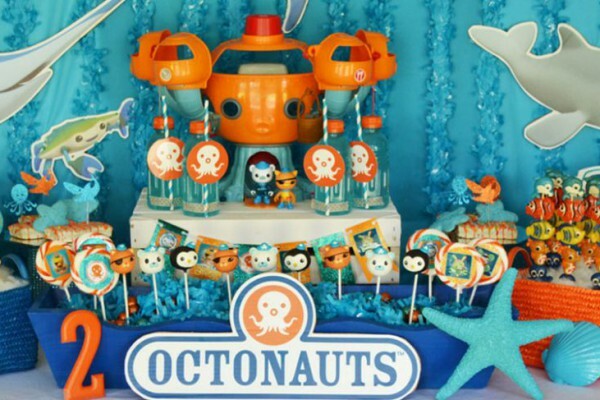 Save some money and use toys that your kids already have to decorate the party space! 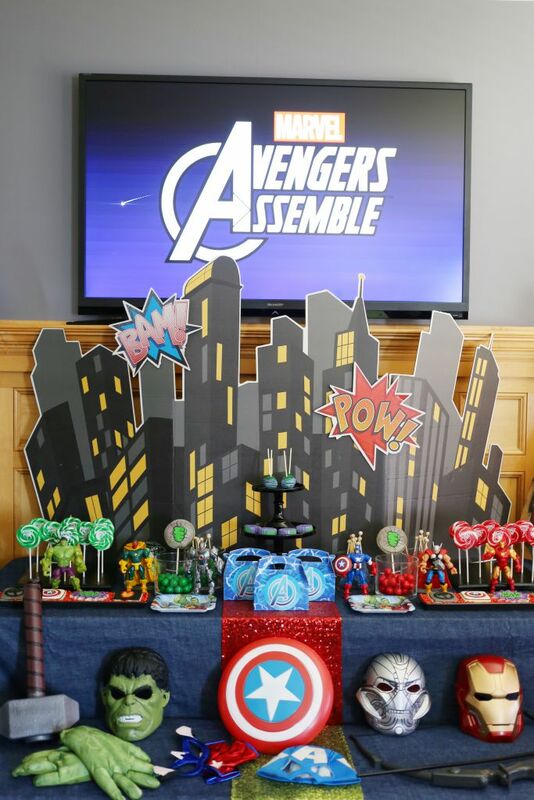 I just displayed my son’s entire collection of Marvel Avengers Superhero Mashers toys and my nephew’s collection of Avengers action figures around the party space. These doubled as a party activity too as the kids played with these during the party. 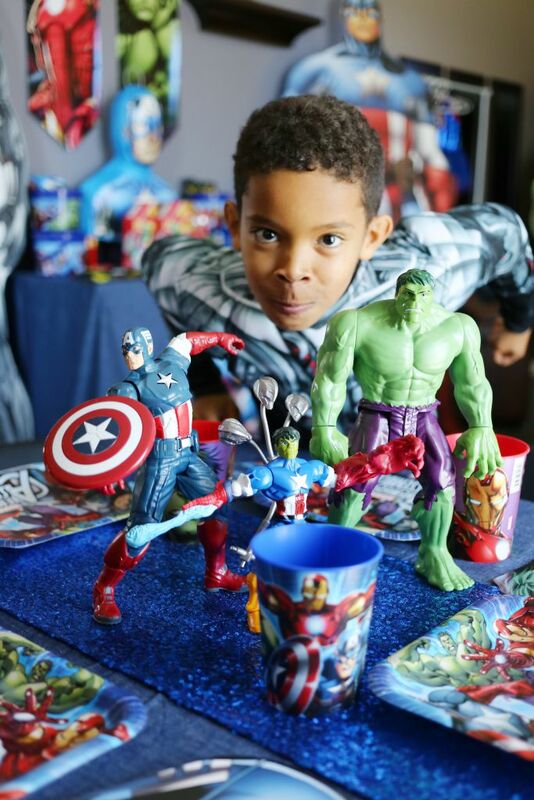 Tip #2: Use a Cardboard Standup as the Backdrop for your Candy Table! 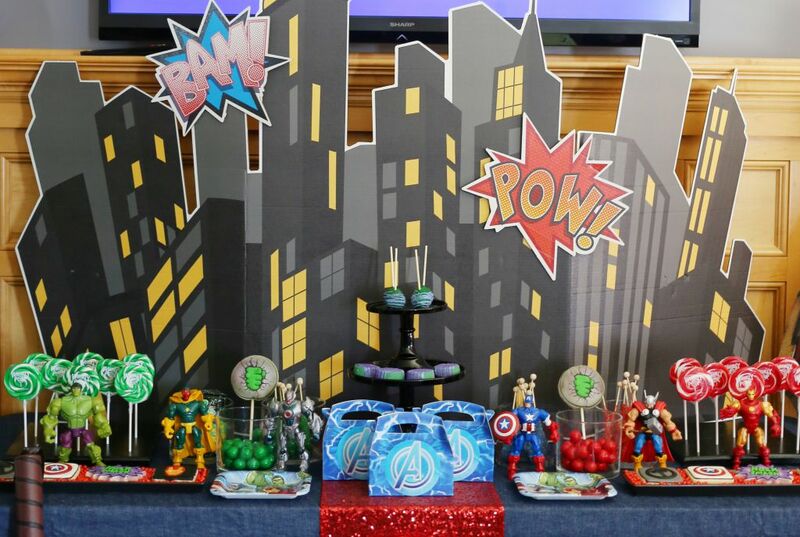 To add a wow factor to the Candy Table, display the 6’ wide Superhero Comics Standup City Scape on your table instead of a backdrop. It fits perfectly on a standard 6’ table and looks amazing with the Hulk and Hulkbuster standups on either side. 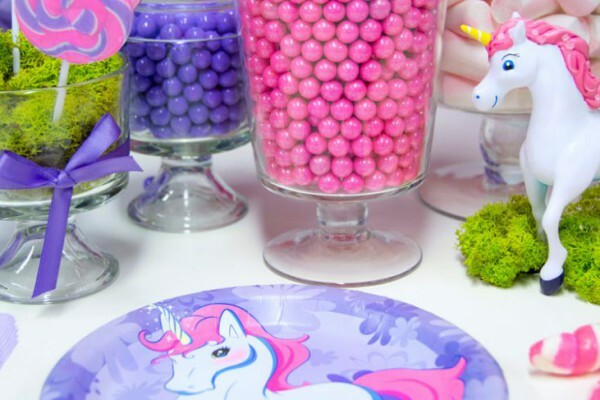 Tip #3: Fill your Candy Table with Color Coordinated Candy! Birthday Express offers lots of candy in individual colors making it easy to order candy that matches your party’s colors. Here I focused on green, red and blue candy that matched most of the Avengers colors. 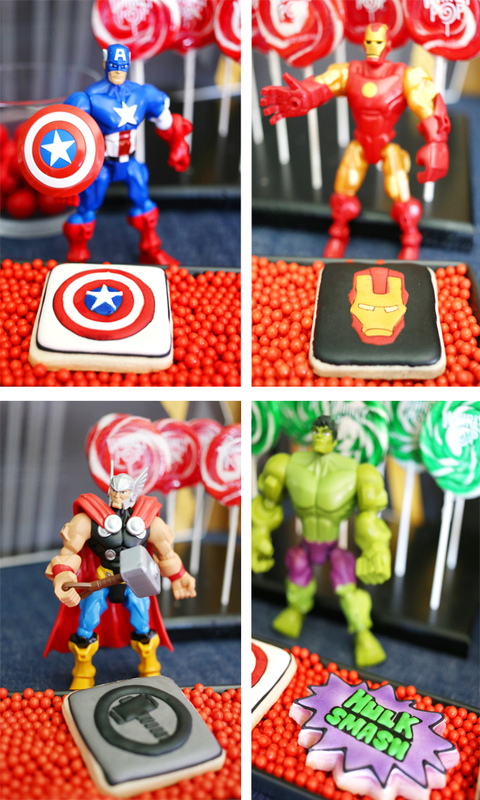 I also added a few custom desserts like these amazing Avengers inspired iced cookies by Auntie Bea’s Bakery. 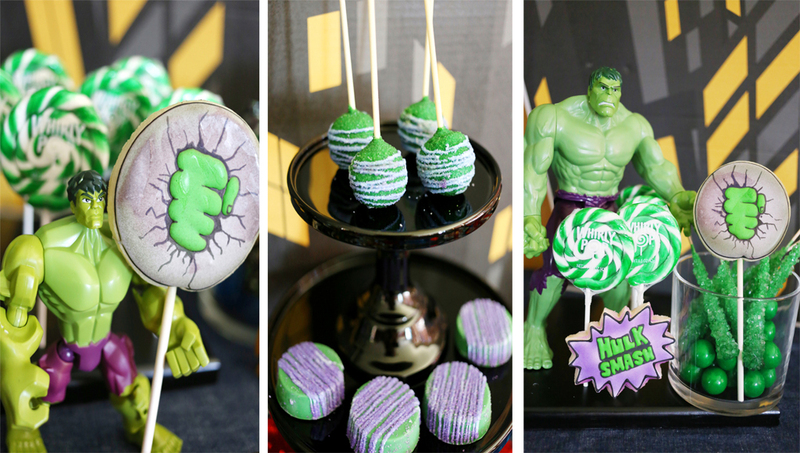 Hulk got his very own section of the menu with some “incredible” cookies on a stick, as well as cake pops and chocolate covered Oreos by Sparkling Sweets Boutique. 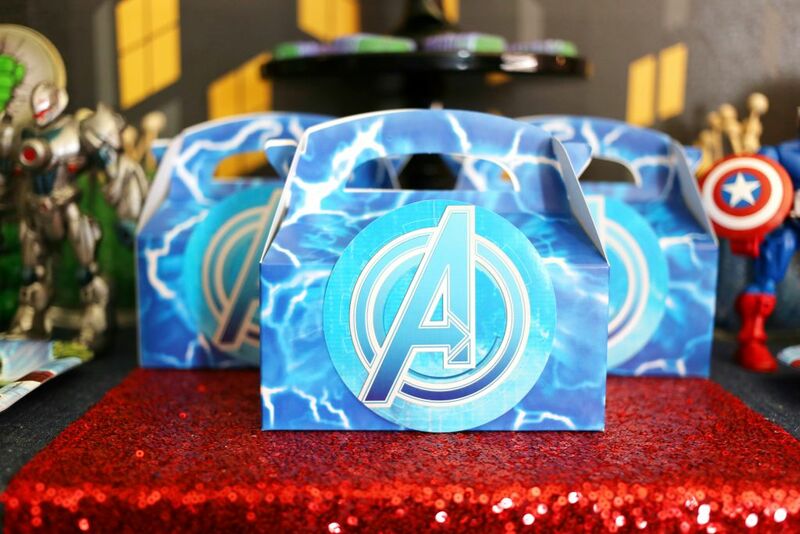 To make it easy for guests to take home all the goodies, be sure to place favor bags or boxes out on the table like these lightning favor boxes inspired by Thor, of course! 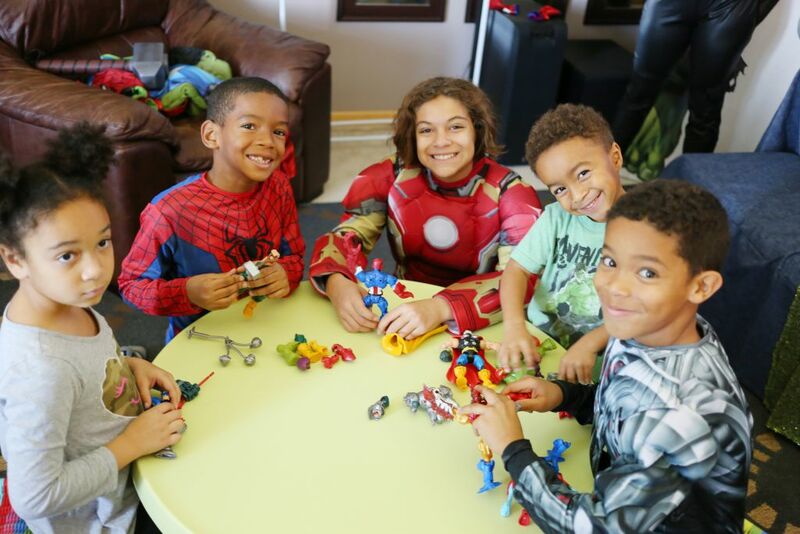 Tip #4: Dress Up Like the Avengers! I don’t know about your kids, but my kids LOVE to dress up in costumes of their favorite characters. Once they have them on, they immediately start acting out scenes from the Avengers. It’s super cute! 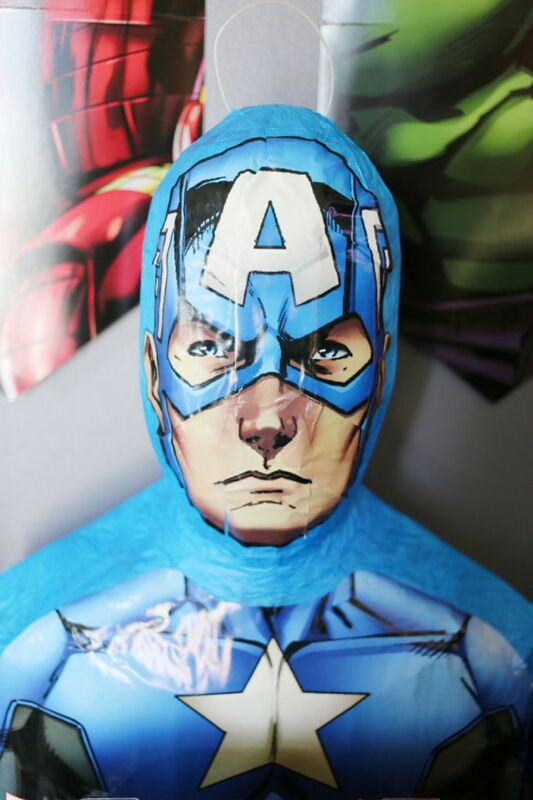 Birthday Express has a great selection of Avengers costumes and accessories. Be sure to know your guests’ sizes before your party so you are sure to have one that will fit everyone. 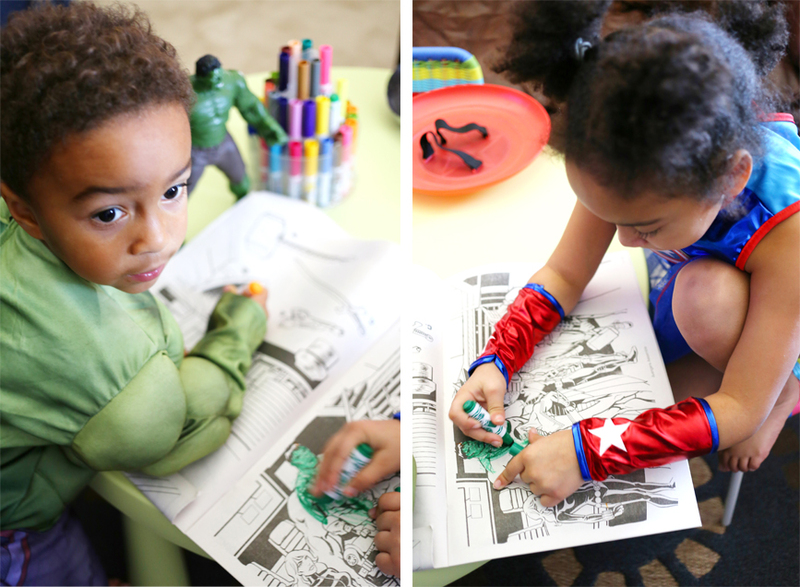 Each guest can take their costumes home with them too…the perfect party favor! Parents, you too can get in on the action. 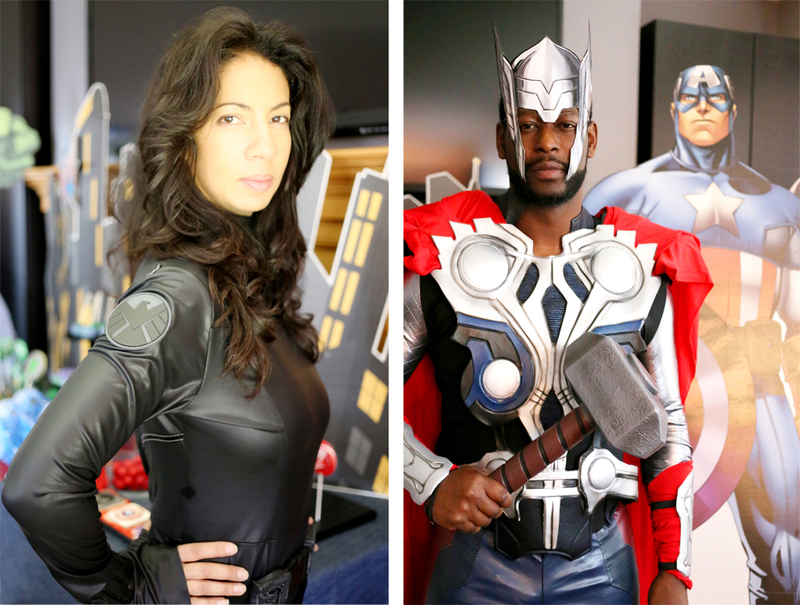 Order a few adult-sized Avengers costumes and host the party! Your kids will LOVE it! 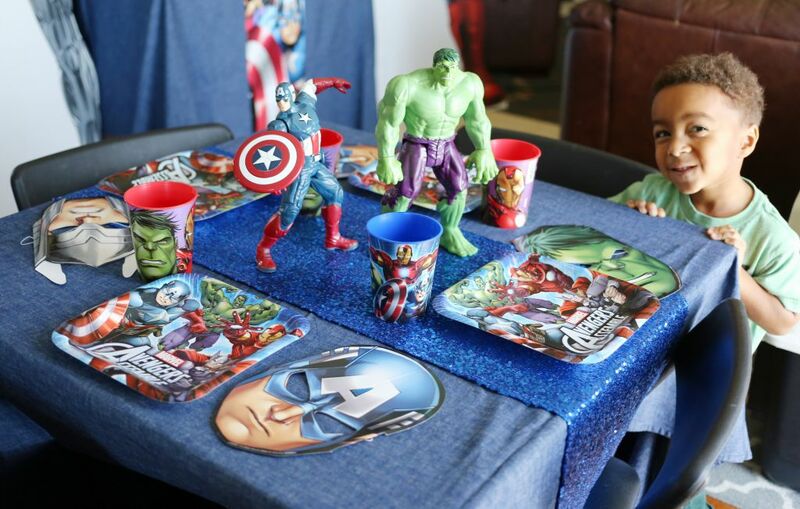 Tip #5: Setup an Avengers Favor Table! I love setting up a favor table with the favors displayed instead of tucked inside a favor bag or box. 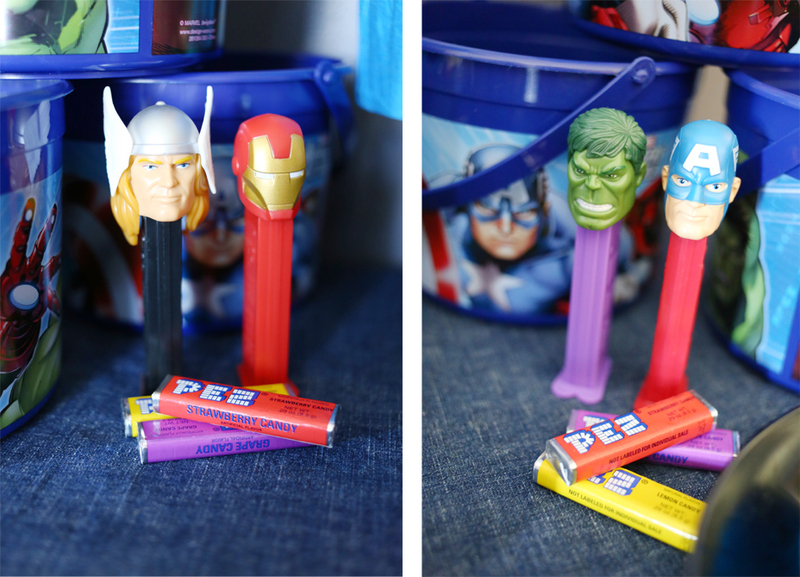 I mean, how cool do the Avengers Pez dispensers look displayed on the table! 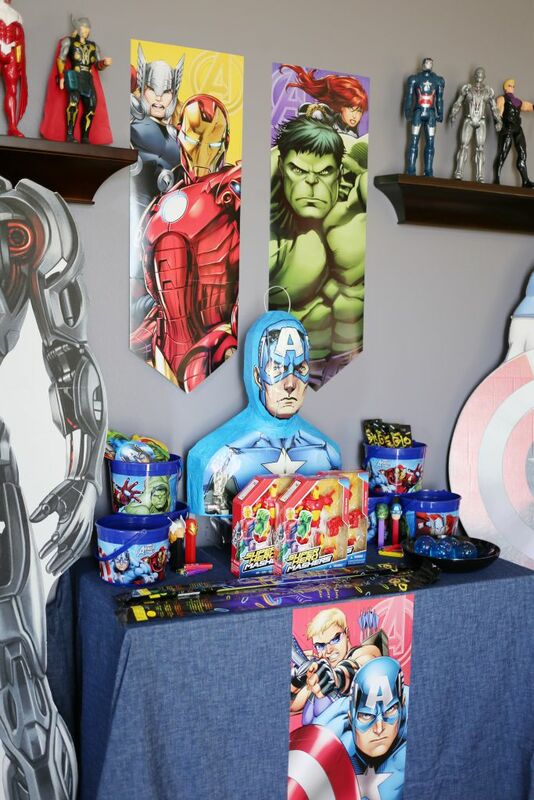 I also used the Captain America piñata as the centerpiece of the table already filled with candy so it’s ready to be strung up when you’re ready. 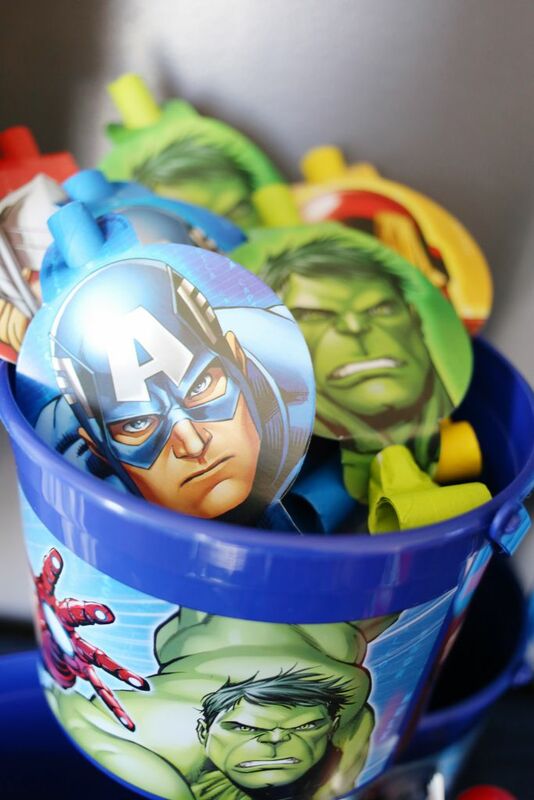 These Avengers plastic buckets are perfect to give each guest to collect all the candy that falls out of the piñata. It’s also big enough for the guests to put the favors in too. Tip #6: Have Fun with Activity Stations! 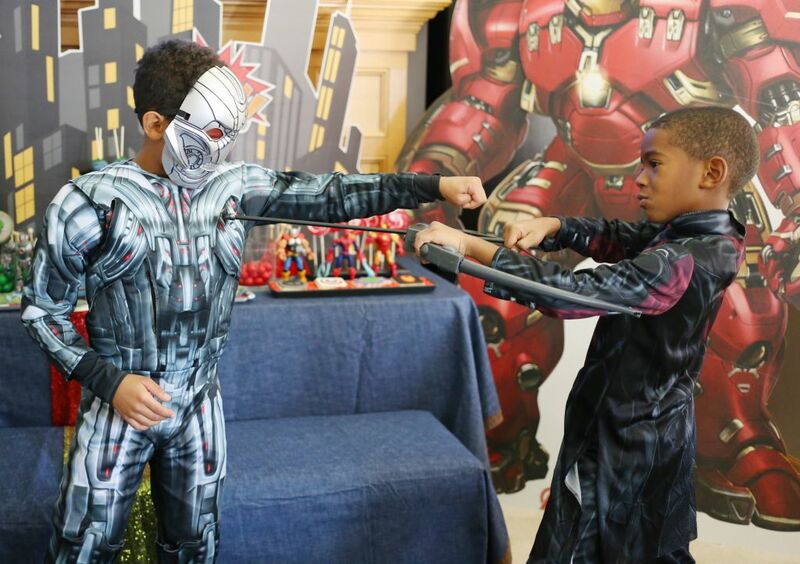 Avengers parties are all about fun and imagination. 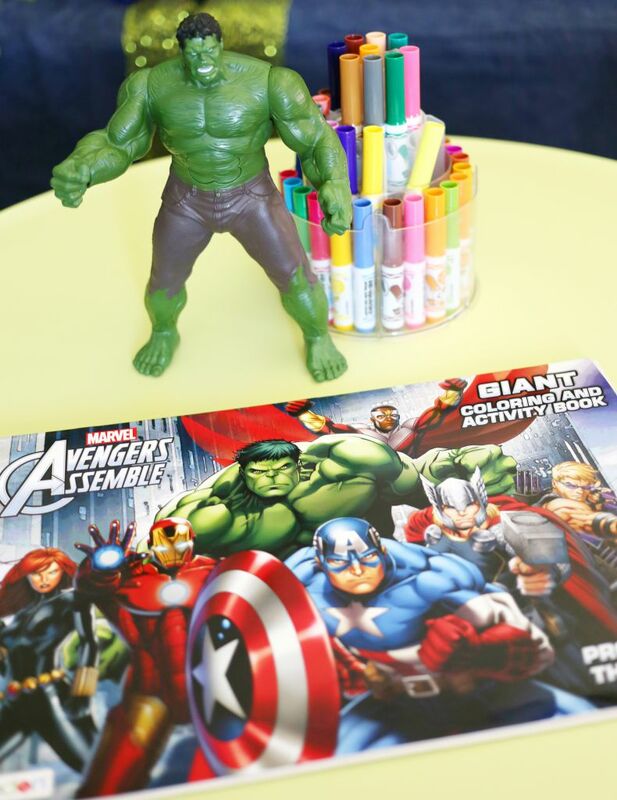 For my parties, I usually start out with a coloring activity as guests arrive since not everyone comes at the same time and coloring is a perfect activity kids can do by themselves while they wait. 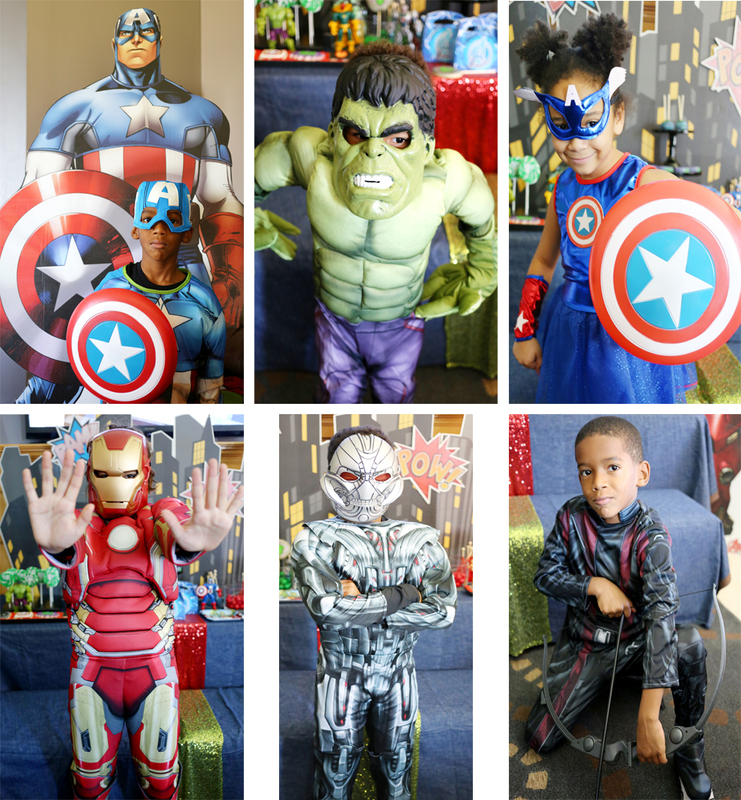 Once everyone arrives, they visit the Dress Up station and transform into Avengers and pose for the camera. 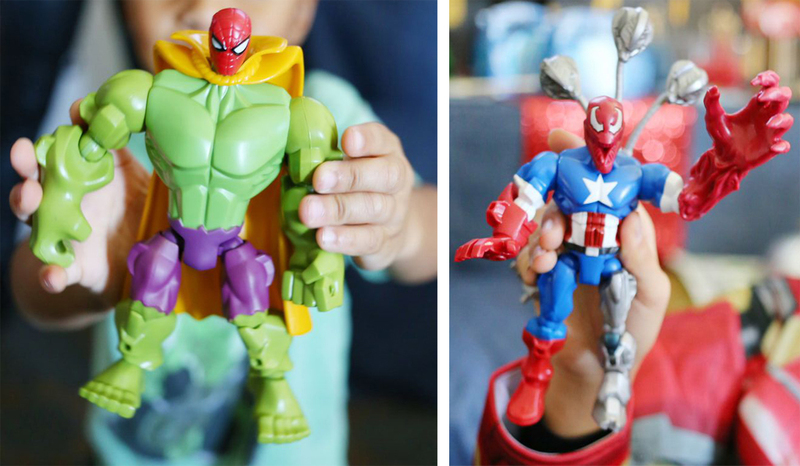 Then it’s time to visit the Superhero Mashers table where the kids mix and match their favorite Avengers characters into their own new superhero. They had a ball doing this. Next it’s time to eat at the Avengers dining table. 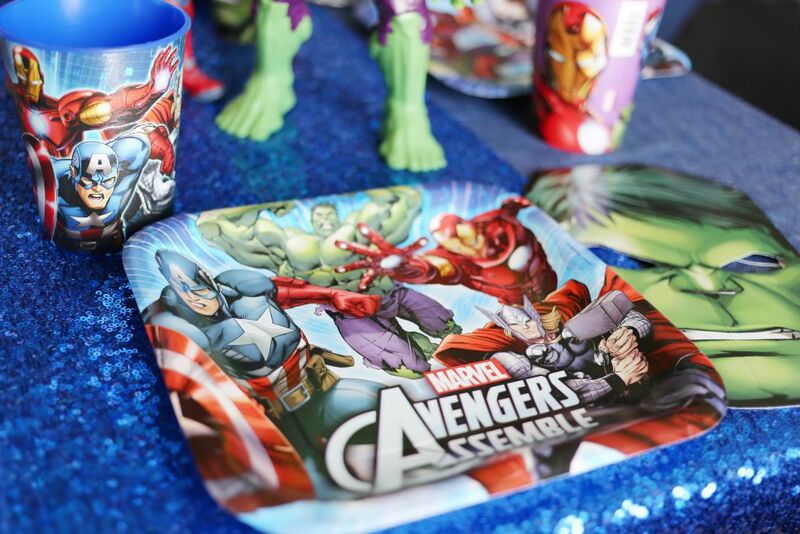 BirthdayExpress has a huge selection of Avengers tableware for all your heroic dining needs. 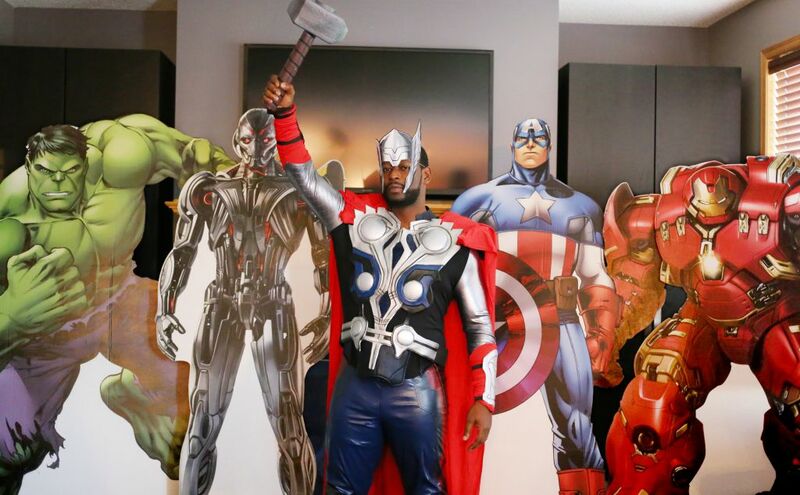 This is when I put on an episode of Avengers Assemble so the kids can watch it while they eat. While the kids are eating, I string up the piñata. After lunch, we end the party with the piñata! 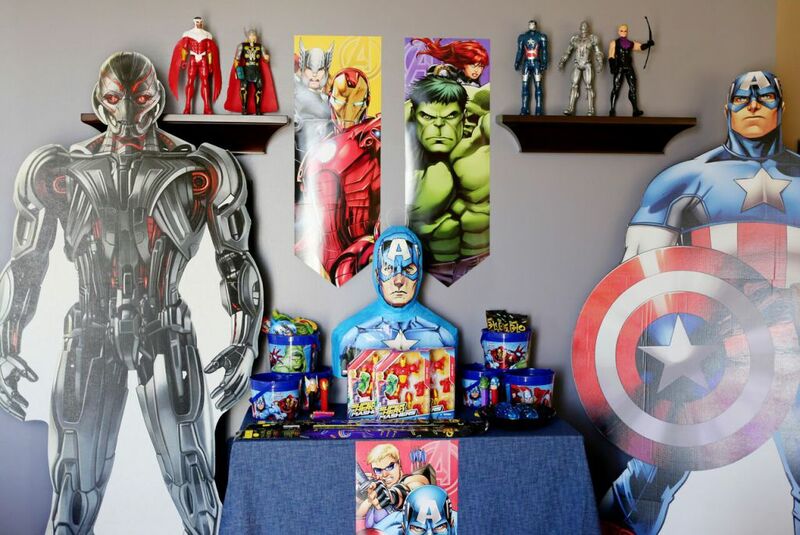 I hope this gives you some inspiration for your next Marvel Avengers party.